This year’s winner for grades K-4 is Risa Elder who teaches 3rd grade science and 4th and 5th grade STEM at Tara Oaks Elementary Schools. Risa has been teaching for 24 years and her teaching philosophy is focused on helping students connect science to their everyday lives. She has directed multiple STEM-based summer camps, collaborated with other teachers to assist them in starting their own STEM clubs, and presented a professional development session about implementing the Picture Perfect Science program in other elementary teachers’ classrooms. Risa has also been awarded a grant to begin a competitive Vex IQ Robotics Team. 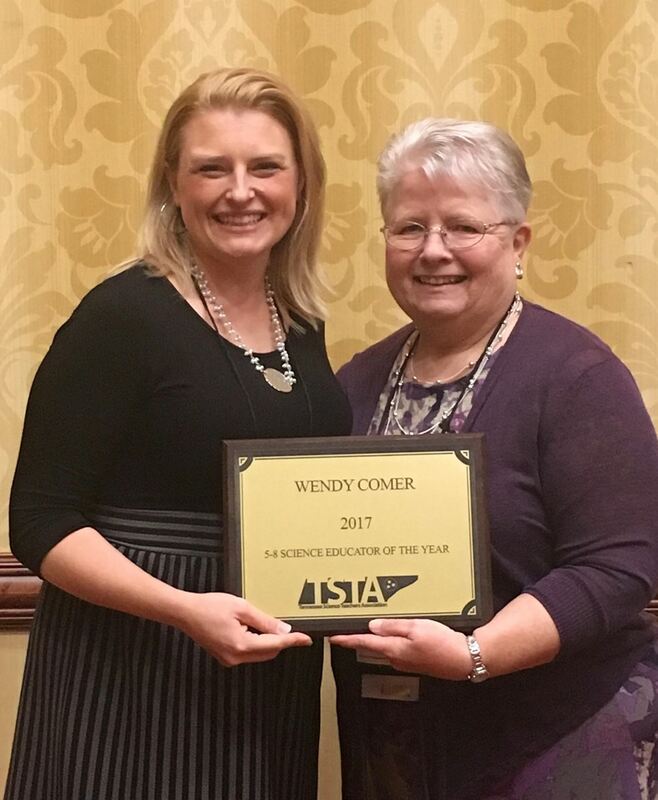 Wendy Comer is a fifth grade science teacher at Crockett Elementary School in the Williamson County School System. She has been involved in education for over 20 years and feels that she is a guide for her students as they are discovering science hands-on and its relation to the real world. Wendy feels that it is her job to model enthusiastic learning for her students and inspire students to question and determine their understanding of phenomena. She is passionate about working with other teachers and sharing ideas and her goals are to instill creativity, passion, courage, and perseverance in both the teachers and students that she works with. Her favorite lesson to teach is ecosystems and the interactions between different sections because of the student observations and discussions throughout the lesson. Wendy is currently on the Science Item Content Review for Grade 5 Committee, the Middle Tennessee Math Teachers - Elementary Representative, and the Williamson County Online Educational Resource Science Team. 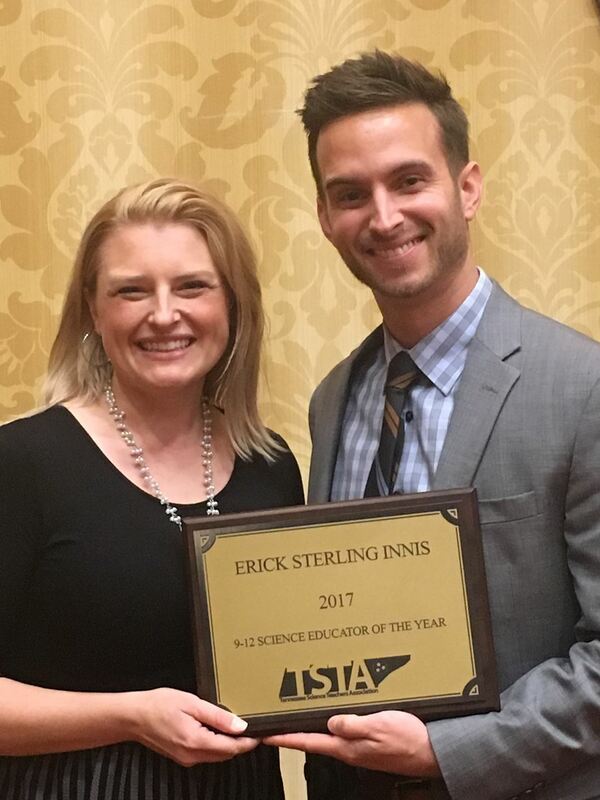 Erick Innis is a 9th and 10th grade biology and cancer biology teacher at McMinn County High School in the McMinn County School System. He was previously a medical student before he felt compelled to become a teacher and is currently in his fifth year of teaching. Erick feels that it is his job to be a “shepherd” so that he can lead students through questions, discovery, rough patches, and just life in general as they venture into adulthood. He is passionate about leading his students to hunger for more knowledge through his energy, comedy, and spontaneity. His favorite lesson to teach is the origin of life for many reasons: the challenge associated with teaching such a polarizing and emotional subject, stretching student comfort zones, and allowing students to really contemplate how intricate and interdependent nature is. Erick is the first ever Level 5 Composite scorer in his school’s history and is currently a mentor teacher and the founder/leader of McMinn Goes International, an educational travel team that explores international locations with a scientific and biological emphasis. Dr. Joanne Logan is a professor at the University of Tennessee - Knoxville and specializes in GIS/GPS, Water and Civilization, and Environmental Climatology. She has been involved in education for over 30 years and is a firm believer in engaged learning and incorporates that into her classroom using a wide range of technologies and techniques. Dr. Logan believes that it is her duty as a senior faculty member to be the exemplar of the best teaching practices for new faculty and is passionate about service learning, especially when she sees her students connecting with younger children. Her favorite topic to teach about is Geographic Information Systems, or GIS, and she enjoys taking students outside so they are able to learning in a more interactive and engaging environment. Dr. Logan currently serves as the President of Gamma Sigma Delta, The Honor Society of Agriculture; on the executive committees of the Sierra Club Harvey Broome Group and Water Quality Forum; as the River Rescue Site Captain; and volunteers at the Ijams Waterfest and Beardsley Farm and Knoxville Botanical Garden’s Center for Urban Agriculture. The Tennessee Science Teachers Association recognizes Dr. Tom Cheatham as our Distinguished Service Award. This award originates from the board of directors’ nominations and is only presented when the organization determines there is someone who meets the criteria for the award. Dr. Cheatham has been an important force in enabling educators in science to grow in their skills and understanding through his leadership as the Dean of the College of Basic and Applied Science and then after retirement as the director of the STEM center at MTSU. The TSTA would like to sincerely thank Dr. Cheatham for empowering the next generation of science leaders in our state.